The PF-10 is a compact floppy drive unit for the PX-8 and PX-4 computers. It uses a 3 1/2" floppy drive, but in 40 track mode. So the track distance (TPI) isn't 1/135" like all other 3 1/2" drives, but 1/67,5". By using only 40 tracks, it is a miniature version of the original QX-10/TF-15/TF-20 5 1/4" floppy format. 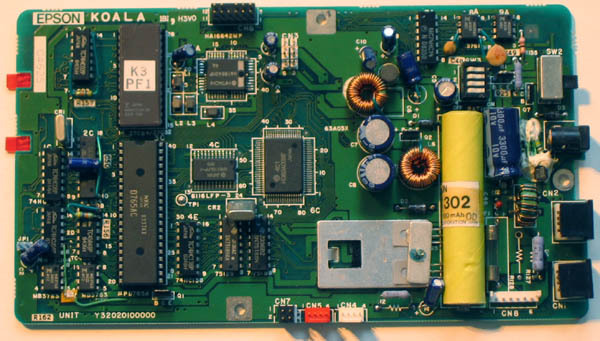 Internally the PF-10 contains a single board containing the processor, floppy controller and floppy control logic like stepper motor control and read/write head amplifiers. The larger optional PF-10 AC adapter (H00D?) can be used to power the PF-10 without batteries, or operation during charging. The H00D? is rated for 1000mA, while the H00A? is only 600mA. The battery light at the front indicates that the main battery is failing and the sub-battery is activated. Stop using the PF-10 and recharge or replace the main battery. Charging time with the AC adapter (HOODA) is approximately 8 hours. When using the PF-10 with standard (non-rechargable batteries (LR14), make sure the sub-battery is sufficiently charged. The PF-10 should be connected to the PX-8 with a #726 cable using the serial interface IN. The serial OUT is used for daisy chaining drives. With the default DIP setting (DIP 3 ON) the PF-10 is designated as drive D:. With DIP 3 OFF, this is drive F:. The standard transmission rate of 38.4 kBaud is set with DIP 4 ON. The other DIP switches are not used and should be ON. As is standard with Epson CP/M floppies, track 0 to 3 of the floppy is reserved for the boot image. Track 39 is not used. The first 16 logical sectors (128 bytes each) of track 4 are reserved for the directory. In this preliminary reverse engineered schematic the relation between the adapter plug, the rechargable battery pack and the dry C-cell connections is drawn. The power plug contains an extra connection which shorts with the plus side if no plug is inserted. Probably the battery pack is charged through the 6.8 ohm resistor. The Operating manual Some what damaged, but still better than not at all. If link is broken see Virtual library. ROM image with the HD63A03XF processor firmware.